There’s a Singaporean restaurant in Quezon City that serves a Malaysian dish as its specialty. The restaurant is Singapore Chicken Rice and the dish is Nasi Lemak. Nasi Lemak is a Malaysian national dish and consists mainly of anchovies, cucumber, peanuts, rice soaked in coconut milk, fried chicken and chili sauce. Nasi Lemak is a Malay word that means ‘fatty rice.’ It originated from the process of cooking rice soaked in coconut. The preparation of Nasi Lemak is similar to the Filipino way of serving rice and chicken in a banana leaf, together with all the other garnishes. It’s a nostalgic feel of sinangag and chicken adobo. In Malaysia, Nasi Lemak is sold along the streets of Kuala Lumpur. The stores selling them resemble the ‘jolly jeeps’ of Makati City that offer different food choices. Although Nasi Lemak is also available in restaurants, the locals prefer the street version; the taste is better, like home-cooked. Here’s how Nasi Lemak is prepared: they scoop cup rice, place it on a banana leaf, put nuts and slices of cucumber on the side, hard boiled egg on the other, cut strips of chicken and add the hot spicy sauce on top of everything, and then fold the banana leaf. The smell of chili sauce and fried chicken greet the senses once you open the banana leaf. The crunchiness of the peanuts, the bitter sweet juice coming from the cucumber, the spiciness and coconut flavored rice compliment each other very well. The dish is also popular in Singapore and Indonesia. Singapore Chicken Rice restaurant in Cubao, Quezon City serves Nasi Lemak on a plate with the rice, peanuts, anchovies and cucumber separated from each other. Sliced fried chicken is arranged on one side with the sweet chili sauce on one corner of the plate. 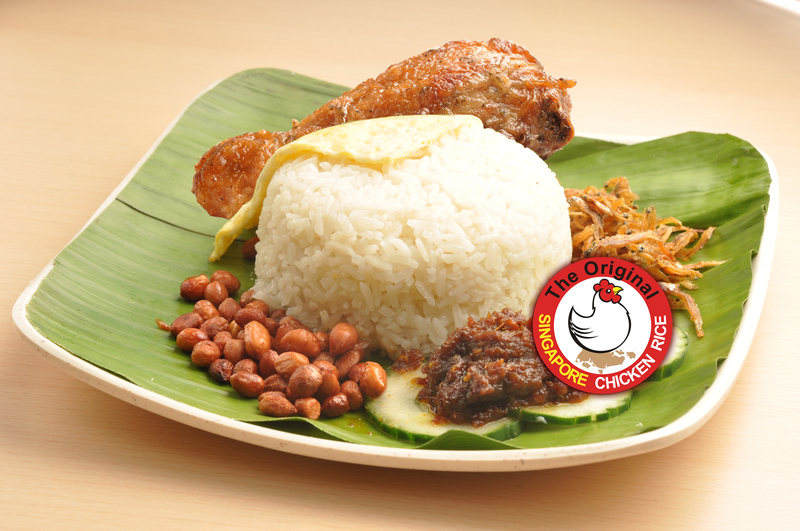 Their version of Nasi Lemak closely resembles the authentic taste of the original Malaysian dish. It may not have the exact kick like the one being sold on the streets of Malaysia and Singapore, but the experience is definitely worth trying. Singapore Chicken Rice also have Kaya Toast — mini toasted sandwiches filled with butter and kaya (a mixture made of coconut milk, eggs and sugar). The sweet creamy delight is a good starter before you eat Nasi Lemak. Another dish on their menu that is equally famous as Nasi Lemak in Malaysia and Singapore is Mee Goreng, or spicy fried noodles. Mee Goreng is made of thin yellow noodles (in the streets of Malaysia they use Maggi noodles) fried with garlic, onion, chicken, prawn, vegetables, tomatoes, pickles and egg. 1. Just like making steamed rice, rinse your rice and drain. Add the coconut milk, a pinch of salt, and some water. Add the pandan leaves to the rice before cooking. 2. Rinse the dried anchovies and drain the water. Fry the anchovies until they turn light brown and put aside. 3. Pound the prawn paste together with shallots, garlic, and deseeded dried chilies with a mortar and pestle. You can also grind them with a food processor. 3. Slice the red onion into rings. 4. Soak the tamarind pulp in water for 15 minutes. Squeeze the tamarind constantly to extract the flavor into the water. Drain the pulp and save the tamarind juice. 5. Heat some oil in a pan and fry the spice paste until fragrant. 6. Add in the onion rings. Add in the anchovies and stir well. 7. Add tamarind juice, salt, and sugar. 8. Simmer on low heat until the gravy thickens. Set aside. 9. Clean the chicken, cut them into half and season with salt. Deep fry. 10. Cut the cucumber into slices and then quartered into four small pieces. 11. Dish up the steamed coconut milk rice and pour some anchovies on top of the rice. 12. Serve with fried chicken, cucumber slices, and hard-boiled eggs.